The Blaster: Stalingrad on the Tigris: The Kobani Model Writ Large? Last summer, in a scene reminiscent of Lawrence of Arabia, the 350,000 man Iraqi army, trained and armed at an expense of $25 billion over a 10 year period by the US, collapsed in a few short weeks after being blitzed by a few thousand, lightly armed, fast moving ISIS irregulars. The crown jewel in the spectacular ISIS offensive was its capture of Mosul, Iraq’s second largest city, on the banks of the River Tigris, 225 miles north of Baghdad. Subsequent ISIS operations quickly captured most of the inhabited areas north and west of Baghdad (see map). 1. To pull this off, CENTCOM must somehow assemble up to 25,000 Iraqi and Peshmerga troops opposite Mosul, then drive out the 2,000 ISIS fighters believed to control the city in a large urban battle. While the Kurdish Peshmerga forces are near Mosul, they cannot take Mosul alone, because a Kurdish attack would drive the Sunni Arabs remaining in Mosul into the arms of ISIS. For the same reason, Iraqi forces must include Sunnis as well as Shia’s. But, the Iraqi forces must march over 225 miles up the Tigris Valley, through ISIS controlled territory, to even reach Mosul. Such a movement would weaken the forces defending Baghdad and open up the real possibility of ISIS spoiling operations in the south, including attacks on the army’s long exposed lines of communication or even Baghdad itself. Moreover, how such a power projection and attack by the newly rebuilt and as yet untested Iraqi army could even be launched before the summer heat impedes the massive movement and heavy fighting is a question that boggles the mind. 2. The biggest CENTCOM advantage is airpower. But airpower is difficult to apply effectively against small units engaged in a big-city urban battle. Moreover, as any soldier who has experienced urban combat will tell you, the chaotic rubble of urban destruction will increase the defensive power of the ISIS positions. And … no one knows how many Sunni Arabs remain in Mosul. Its population numbered 1.8 million in 2008, but about 500,000 fled after ISIS conquered it in 2014. The population was mostly Sunni Arab, but with Assyrian, Turkmen, and Kurdish minorities. Today Mosul is overwhelmingly Sunni, and as many as a million Sunnis may remain in the city. To be sure, many of these Sunnis hate ISIS, but an attack on Mosul could drive them to support (or not oppose) ISIS. 3. Another large uncertainty is the strength of ISIS. The CIA estimates ISIS forces to number between 20,000 and 31,500, with as many as 20,000 foreigners, while as Patrick Cockburn notes in the attached report, others believe its forces number over 100,000. Whatever the case, it is clear that ISIS has the sufficient numbers to reinforce Mosul, or more importantly, and more likely in my opinion, ISIS has the forces needed to launch spoiling attacks against weakened Iraqi defense elsewhere, including LOCs and Baghdad. 4. Finally, as Cockburn points out, ISIS is still swimming in resources, with the Gulf oil states still bankrolling it. Given these complications, which are explained in greater detail below, a natural question arises: Why is CENTCOM telegraphing its punch? Why sacrifice surprise in what would be a rapid and audacious deep stroke that depends on surprise? Some reporters have interpreted the CENTCOM announcement as an effort to out-psych ISIS. But how? Perhaps, and I am only guessing, CENTCOM planners believe they can taunt ISIS and hype its arrogance to a point where ISIS forgets why it lost the siege at Kobani. In this vein, perhaps CENTCOM planners assume ISIS leaders are so stupid, that waving the red flag in front of the bull will enable Iraqi-Peshmerga ground forces to fix ISIS, while US and allied forces methodically bomb ISIS to smithereens in a gigantic repeat of Kobani. Let us hope the Kobani model is NOT part of the psyops operation. The model does not apply to Mosul. Kobani was a small city of 45,000 located in the open country. Mosul, in contrast, is a huge sprawling city with perhaps about a million Sunni Arabs remaining in its environs. Planners would due well to remember that in August 1942, Stalingrad had a pre-siege population of 400,000, or about half that of ISIS-occupied Mosul. The Kobani model applied to a siege of Iraq’s second largest city would imply a siege on a sprawling urban scale far larger than the relatively compact city of Stalingrad. To be sure, destruction would not be as great due to our obvious resource limitations, but the urban battlefield would be far larger than Stalingrad and far more complex than Kobani. Perhaps more sensible heads will prevail in this psyops operation, because it looks like we are in for a long war. The US has being trying to stop such private donors in the Gulf oil states sending to Islamic State (Isis) funds that help pay the salaries of fighters who may number well over 100,000. Fuad Hussein, the chief of staff of the Kurdish President, Massoud Barzani, told The Independent on Sunday: “There is sympathy for Da’esh [the Arabic acronym for IS, also known as Isis] in many Arab countries and this has translated into money – and that is a disaster.” He pointed out that until recently financial aid was being given more or less openly by Gulf states to the opposition in Syria – but by now most of these rebel groups have been absorbed into IS and Jabhat al-Nusra, the al-Qaeda affiliate, so it is they “who now have the money and the weapons”. Mr Hussein would not identify the states from which the funding for IS comes today, but implied that they were the same Gulf oil states that financed Sunni Arab rebels in Iraq and Syria in the past. Iraqi leaders in Baghdad privately express similar suspicions that IS – with a territory the size of Great Britain and a population of six million fighting a war on multiple fronts, from Aleppo to the Iranian border – could not be financially self-sufficient, given the calls on its limited resources. Islamic State is doing everything it can to expand its military capacity, as the Iraqi Prime Minister, Haider al-Abadi, and the US Central Command (CentCom) threaten an offensive later this year to recapture Mosul. Regardless of the feasibility of this operation, IS forces are fighting in widely different locations across northern and central Iraq. On Tuesday night they made a surprise attack with between 300 and 400 fighters, many of them North Africans from Tunisia, Algeria and Libya, on Kurdish forces 40 miles west of the Kurdish capital, Irbil. The Kurds say that 34 IS fighters were killed in fighting and by US air strikes. At the same time, IS was battling for control of the town of al-Baghdadi, several hundred miles away in Anbar province. Despite forecasts by a CentCom spokesman last week that the tide has turned and that IS is on the retreat there is little sign of this on the ground. On the contrary, IS appears to have the human and financial resources to fight a long war, though both are under strain. According to interviews by The Independent with people living in Mosul reached by phone, or with recent refugees from the city, IS officials are conscripting at least one young man from every family in Mosul, which has a population of 1.5 million. It has drafted a list of draconian punishments for those not willing to fight, starting with 80 lashes and ending with execution. All these new recruits receive pay, as well as their keep, which until recently was $500 (£324) a month but has now been cut to about $350. Officers and commanders receive much more. A local source, who did not want to be named, says that foreign fighters, of whom there are an estimated 20,000 in IS, get a much higher salary – starting at $800 a month. Ahmad added: “Isis fighters have arrested four high-school teachers for telling their students not to join Isis.” Islamic State fighters have entered the schools and demanded that students in their final year join them. Isis has also lowered the conscription age below 18 years of age, leading some families to leave the city. Military bases for the training and arming of children have also been established. Given this degree of mobilisation by Islamic State, statements from Mr Abadi and CentCom about recapturing Mosul this spring, using between 20,000 and 25,000 Baghdad government and Kurdish forces, sound like an effort to boost morale on the anti-Isis side. The CentCom spokesman claimed there were only between 1,000 and 2,000 Isis fighters in Mosul, which is out of keeping with what local observers report. Ominously, Iraqi and foreign governments have an impressive record of underestimating Isis as a military and political force over the past two years. The Kurds want heavy weapons including Humvees, tanks to surround but not to enter Mosul, snipers’ rifles, because Isis has many highly accurate snipers, as well as equipment to deal with improvised explosive devices and booby traps, both of which Isis uses profusely. Above all, Kurdish participation in an offensive would require a military partner in the shape of an effective Iraqi army and local Sunni allies. Without the latter, a battle for Mosul conducted by Shia and Kurds alone would provoke Sunni Arab resistance. Mr Hussein is dubious about the effectiveness of the Iraqi army, which disintegrated last June when, though nominally it had 350,000 soldiers, it was defeated by a few thousand Isis fighters. Of course, an anti-Isis offensive has advantages not available last year, such as US air strikes, but these might be difficult to use in a city. The US air force carried out at least 600 air strikes on the Isis-held part of the small Syrian Kurdish city of Kobani before Isis finally retreated after a siege of 134 days. In the most optimistic scenarios Isis splits or there is a popular uprising against it, but so far there is no sign of this and Isis has proved that it exacts merciless vengeance against any individual or community opposed to it. Mr Hussein makes another important point: difficult and dangerous though it may be for the Kurds and the Baghdad government to recapture Mosul, they cannot afford to leave it alone. It was here that Isis won its first great victory and Abu Baqr al-Baghdadi declared the caliphate on 29 June last year. At the moment, Peshmerga forces are only eight miles from Mosul. But Isis fighters are likewise not much further from the Kurdish-held oil city of Kirkuk, which Isis assaulted last month. Given the size of Iraq and the small size of the armies deployed, each side can inflict tactical surprises on the other by punching through scantily held frontlines. 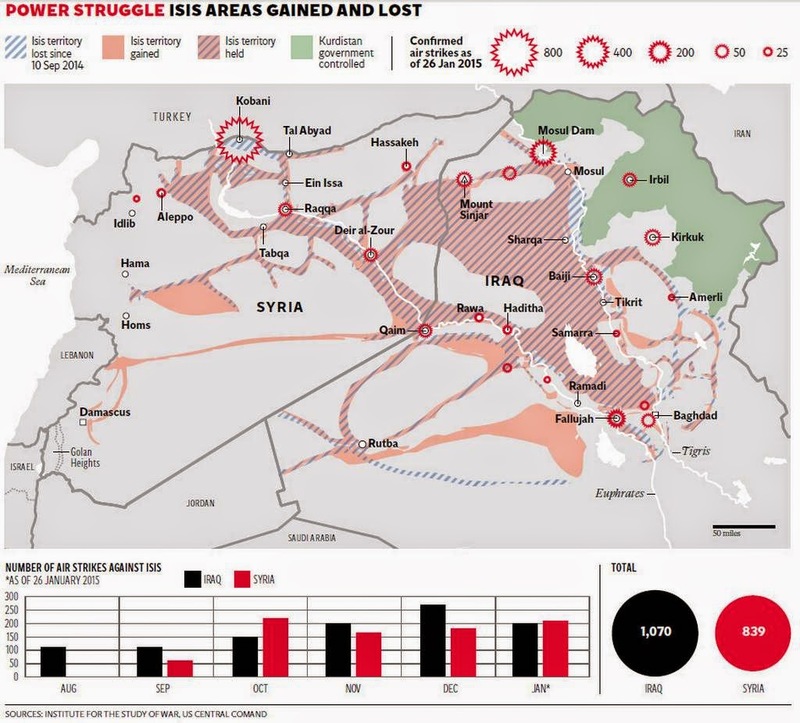 There are two further developments to the advantage of Islamic State. Even in the face of the common threat, the leaders in Baghdad and Erbil remain deeply divided. When Mosul fell last year, the government of Prime Minister Nouri al-Maliki claimed that the Iraqi army had been stabbed in the back by a conspiracy between Kurds and Isis. The two sides remain deeply suspicious of each other and, at the start of last week, a delegation led by the Kurdish Prime Minister Nechirvan Barzani failed to reach an agreement in Baghdad on how much of Iraq’s oil revenues should go to the Kurds in exchange for a previously agreed quantity of oil from Kurdish-held northern oilfields. “Unbelievably, the divisions now are as great as under Maliki,” says Dr Othman. Islamic State has made many enemies, but it may be saved by their inability to unite.